With summer in full effect, hot days & the office dress code relaxed casual... its time for me to rock some bermuda shorts. I have several pairs of fit flared pants that I purchased from the Loft last year, but sadly, once I got home & tried them on, I wasn't really feeling the look on me & too lazy to return them. The fit part was ok, but the flared leg design was just too exaggerated and remember from someone's fashion blog that all Fit Flared pants are not created equal. So these pants were the perfect candidate for refashioning. Last night I went into refashion mode, which was easy peasy, tried on the pants, marked where I wanted to cut (just below the knees), cut, serged raw edges, and hemmed (cut a 1-1/2" strip of interfacing, ironed above the fold line of the hem and hand stitched the raw edge to the interfacing).... Finito. 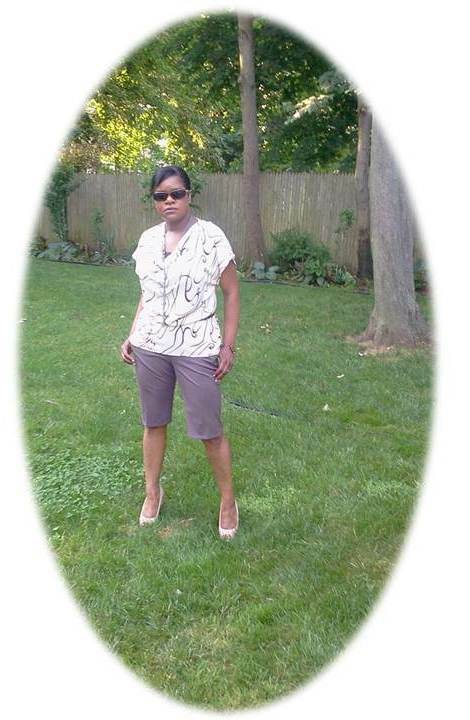 I paired the shorts with New Look 6915 (circa 2010), which is a sheer poly and donned a brown cotton cami underneath. This pattern has become a TNT ... when I want an easy breezy look & instant gratification NL6915 is it. Nice refashion! I don't have enough pants to do this, myself. I think I'm just gonna go out and but some shorts. Not motivated to make them. The bermudas are a good look on you. Good job. I love the way you are posing. @ Adelaide: Honestly, I'm not motiviated to make any either. Of late, I have been scoring my closet and instead of readily giving items away, I am rethinking and refashioning. OK who ticked you off now? LOL - Savannah said it wasn't her and I know it was not Roco. I love the refashioned shorts! Love your nice cool look! You look fab. That's such a 'cool' look. Cute! 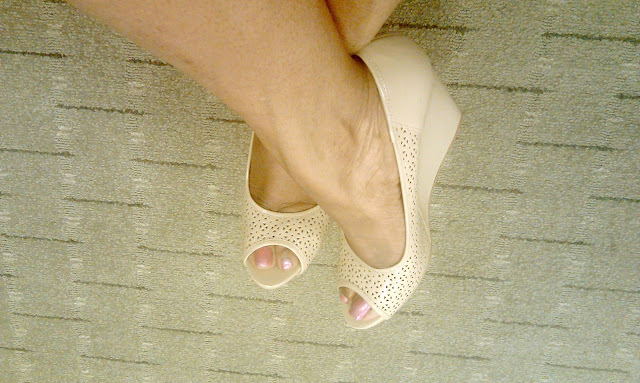 And thanks for hooking me up with my shoe fix - you're my Nine West dealer! The top is cute, but WOO HOO!, I love the bermudas. A great summer look for you. Perfect length for you :-) I love bermudas. I love bermudas! You did a great job with the refasion! Sheila, I don't know how I missed this post!! Nice way to refashion!! I absolutely love this look on you! I see these bermuda shorts on women in the office all the time and just didn't think it would fit for me...now after seeing yours, I'd really love to give them a try. This would be a good way to do it inexpensively! Love the top too...all of them! Great post!